With the festive season gone and the new year beginning, everyone is looking for healthy ways to start the year, and also ways to lose any extra pounds they may have gained during the holiday season. Fortunately, you don’t have to eat bland, tasteless food to lose weight. Instead, you can eat tasty crepes. The key is to find healthy substitutes for the ingredients such as using whole-grain flour or buckwheat flour instead of refined flour and holding off on the syrup choices. Crepes are an exciting meal that tastes delicious, offers nutritious varieties, and helps you stay full till your next meal. They also help to avoid unnecessary snacking. Even healthy fast food restaurants are beginning to realize their popularity and have made it a point to include crepes on their menu. This is easy to make and loaded with nutritious ingredients. If you don’t have carob, you can use dark chocolate chips instead. Add in coconut and cinnamon for the unique flavour to enjoy a delicious meal that doesn’t add much to your daily calorie intake. Zucchinis are rich in fibre, iron, and protein and contain zero fats, which is why these lentil-zucchini crepes make a hearty, nutritious meal any time of day. Add finely chopped onions, freshly ground pepper and sea salt for more flavour. While sweet potatoes are a great source of fibre and Vitamin B and C, chia seeds are superfoods, rich in protein and omega-3 fatty acids. They add a nice, nutty flavour and texture to the meal. You could also use pumpkin instead of sweet potato and add cinnamon powder. If you get a craving for pumpkin pie, make this healthy substitute instead, using whole-wheat flour and fresh pumpkin puree. This sweet, flavourful and nutritious meal is the right way to start your day. You could also add a whipped topping of your choice and have it for dessert. If you are looking to lose some weight, it helps to include quinoa, a superfood rich in fibre, protein, and antioxidants, in your diet. You could also add flavoured Greek yogurt to have a nutritious, tasty, and satisfying meal. Made of only two ingredients, roasted and mashed sweet potatoes and eggs, these are quite easy to make. You can make these simple and light crepes for any meal during the weekdays. Add a dash of cinnamon powder and allspice to enhance the taste. Make this gluten-free, delicious recipe using mashed bananas and oats to enjoy a guilt-free meal. Add a pinch of cinnamon powder, sliced fruits and low-calorie syrup to complete the dish. 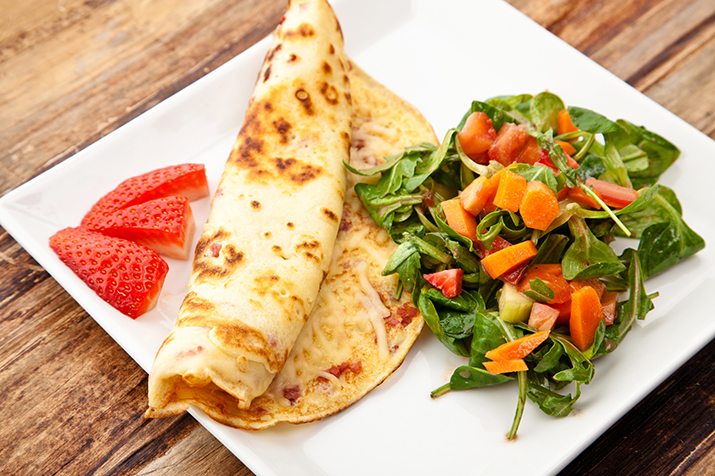 Crepe Delicious is a popular healthy fast food place known for delicious and nutritious crepes. We use only the freshest and finest ingredients for our creations. When you get a craving to eat something healthy, hearty and tasty, visit the location nearest you to explore our menu and discover your favourites. Enjoy a meal that leaves you feeling full with no guilt.